It's official I am obsessed with spray paint. Yes I know it is not the most envirnmentally friendly of items so I have to give it up. Oh well I had fun while it lasted (until hubsters reminded me that its bad for the environment to which I responded, so is driving a car). If anyone knows an environmentally friendly alternative to my obsession please let me know. I am postponing my Etsy Shop set-up until August. More on why to come at a later date. My husband can not stop eating Reindeer sausage, my non red-meat eating self is grossed out. River Colors Studio & Blackbird Baking Company tomorrow from 12-5. Just look for the girl with all of the T-shirt dresses. I was going to post some of what I will be sewing, but I never got around to taking the pictures. 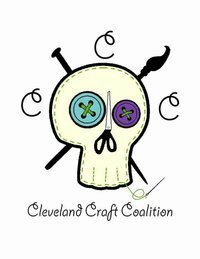 This event is being put on by the Cleveland Craft Coalition. Check out their facebook page if you have a chance because they truly do rock. I mean how awesome is there logo? Yeah I know it is so cool. Hope to see you there, if not you will just have to wait till August to purchase something from my ETSY shop. Have a great weekend! Oh and if you haven't linked up to Upcycled Awesome it is open until Sunday night.